A new report on climate action impacts was presented to the world community today. The aim is to equip city leaders and policy-makers with the tools to finance more climate actions by factoring in the wider benefits of these actions. Ramboll and C40 jointly crafted the report. Get on your bike, mate! Copenhagen and Prague inspire Australia when it comes to climate-friendly and cost-effective mobility incentives. According to the World Bank, only a small percentage of the funding needed to deliver on the Paris Climate Agreement is currently made available. Adding to this, cities the world over often find themselves sitting on competing agendas which makes building a solid case for climate actions immensely hard. To address those challenges and more, C40 Cities and Ramboll just launched a new report entitled Urban Climate Action Impacts Framework. The report was unveiled at the World Urban Forum in Kuala Lumpur earlier today. - This report is a strong testament to our ambitions of delivering evidence-based impacts and align our work to the UN SDG’s in the best possible way. At Ramboll, we sincerely hope the report will be of value to city leaders in their attempts to ramp up on the climate action delivery - based on a solid business case, says Henrik Stener Pedersen, Director for Infrastructure & Society in Ramboll’s Management Consulting division. - We are very pleased to present the report as it is the first of its kind. 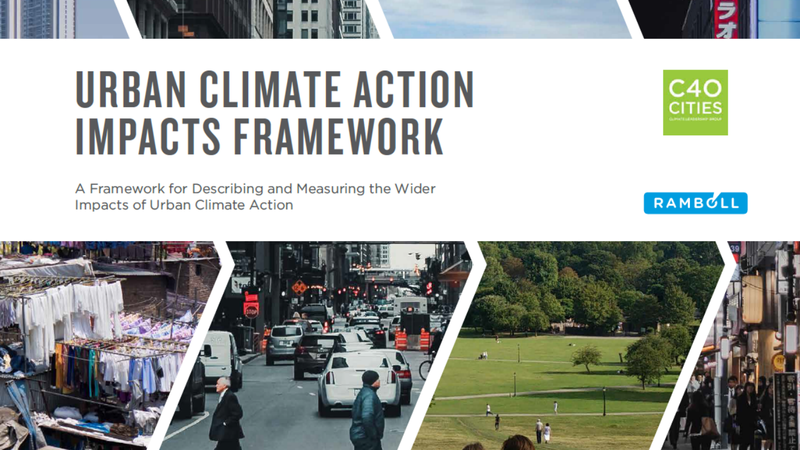 Various methods already exist on the topic, but we know from previous research and workshop conducted in connection with this report that our cities lack a comprehensive and robust evidence base to drive their climate actions. And so far, the evidence has not been in a form needed by city leaders and policy-makers. We aim to change this fact with our new report as this is vital to reaching the Paris Agreement. As the title indicates, the report’s main component is the so-called ‘Urban Climate Action Impacts Framework’. The framework can be applied when exploring the wider impact of city climate action, and builds on the work started by C40 and LSE. The report functions as a user guide with common principles, taxonomy and guidelines for approaching the mapping and assessment of those wider impacts. According to the authors, this is the evidence that urban stakeholders need to guide and make the case for climate action. The lack of evidence and support available to cities on how climate change relates to health and prosperity must be addressed. This complexity makes taking decisive action very challenging, in terms of understanding the interlinkages between urban agendas, and then comparing and prioritising them. Two main problems exist, says co-author, Karin Attström, one of Ramboll’s experts on Social & Economic Impact assessments. Even in cases where generally climate action is accepted as a priority, cities, their leaders and staff, often do not have the locally specific tools and evidence to; one, design action plans that maximize these benefits and are equitable, and two, then persuade all stakeholders of these benefits. - For instance, a city may be considering a congestion charge, recognising that it can be an effective climate action, and also deliver significant other benefits such as productivity improvements from reduced congestion, or improved citizen health through better air quality. However, without evidence on how significant these impacts are likely to be for that city, cities cannot make a firm case, or perhaps they even counter opposition to the action, Attström explains. - A city needn’t eradicate all poverty before considering acting on climate change. Increasingly, the evidence is that the most prosperous urban development approach is a sustainable one. For instance, this was uncovered in the report Seizing the Global Opportunity, which demonstrates that cities investing in low carbon development will raise living standards faster and embed stronger economic growth than those that stick with the old fossil fuel model. - The needs of integrated and holistic development plan at national and central level, at regional and state level and at local level is very important to consciously implement the New Urban Agenda and the 17 Sustainable Development Goals. With good governance and outcome based. - In collaboration with the World Bank and other UN agencies, we are committed to facilitating increased financing of urbanization for countries and cities. This is good news for city leaders. Hope is, that the new C40/Ramboll climate action framework makes translating aspiration to concrete business cases easier. To further pave the way, an online framework tool in currently in the making by Ramboll and C40. The report was delivered by a team composed of C40 and Ramboll experts. Experts from 12 additional organisations and 15 major cities contributed to the project by providing input and feedback at several stages of the process.